“Behold, the man!” said Pilate. And there stood Jesus “like a lamb led to the slaughter or a sheep before the shearers, He was silent and opened not His mouth”. The unblemished lamb became a tortured victim for the sin of the world. And throughout the world, He is still victim in the lives of those who suffer tragedy, illness, injustice, poverty and depression. We are Jesus on earth today and in the course of our lives, we live out His life in its human mysteries. Some may be living through His life in the desert. Those who go unnoticed, live Jesus’ hidden life. Some may labor wearily for a living following the Carpenter from Nazareth. Others reach out to heal and teach, or enjoy friends as He did in Bethany. 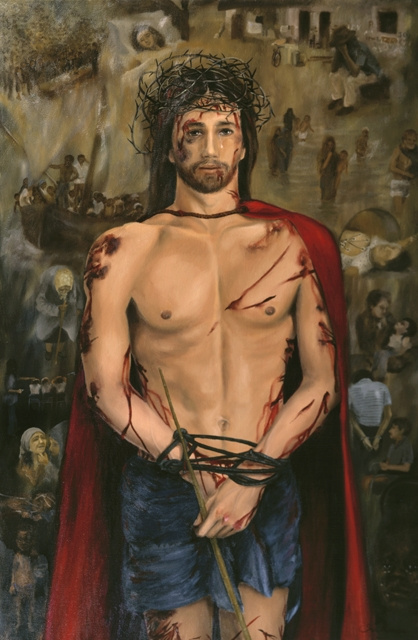 However, for his chosen ones, He saves the ultimate moments of His life; these are the ones who are living His sorrowful passion; His sacrifice that redeemed the world. May we be found worthy and willing to share as His employees in redeeming the present world!